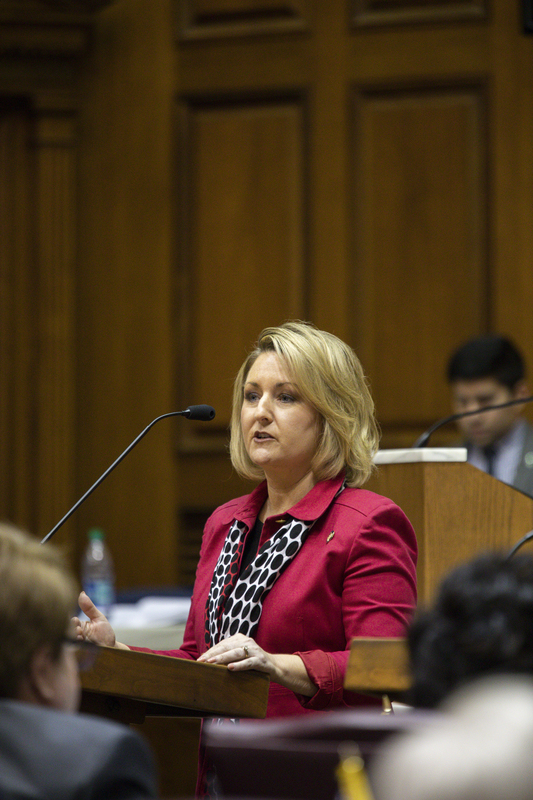 STATEHOUSE (Feb. 22, 2019) – The Indiana House of Representatives passed legislation on Thursday co-authored by State Rep. Christy Stutzman (R-Middlebury) prohibiting the practice of dismemberment abortions in Indiana. PHOTO CAPTION: State Rep. Ryan Lauer (R-Columbus) pairs sneakers with his suit to draw attention to National Cancer Prevention Month Tuesday, Feb. 19, 2019, at the Statehouse in Indianapolis. 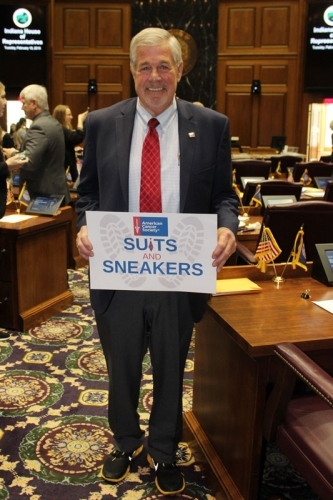 Each year, the Indiana House of Representatives participates in the Suits and Sneakers challenge, an annual event hosted by the American Cancer Society and the National Association of Basketball Coaches. Lauer showed his Bartholomew County pride by wearing Chuck Taylors in Columbus school colors. STATEHOUSE (Feb. 21, 2019) – The House of Representatives voted in supported of State Rep. Woody Burton’s (R-Whiteland) legislation protecting property owners from being held accountable for their tenants’ unpaid utility bills. Education, both in and outside the classroom, has been a constant theme this session. In the legislature, we are always looking into ways to enrich the lives of Hoosier students. Some of these approaches include classes and extracurricular activities to develop important skills. These education opportunities are valuable for our students, our community and our state. 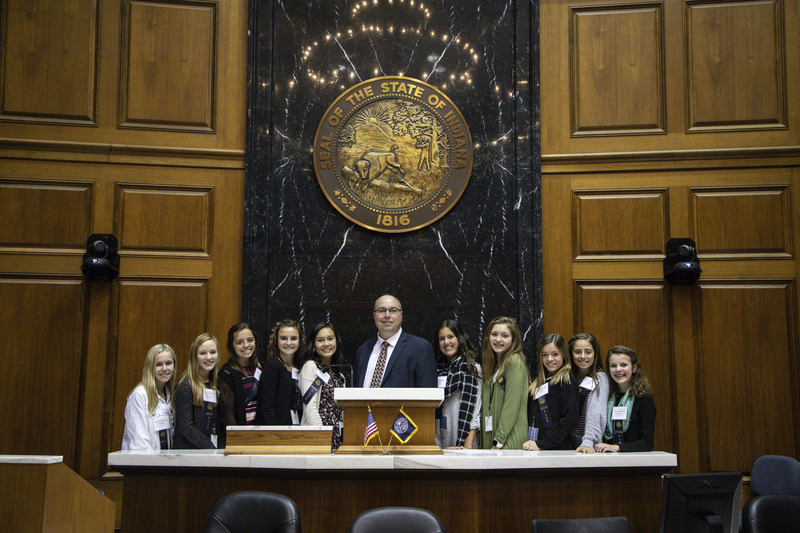 STATEHOUSE (Feb. 21, 2019) – State Rep. Curt Nisly (R-Milford) recently welcomed NorthWood Middle School students to the Statehouse. 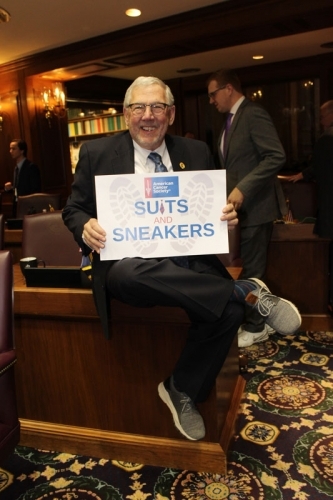 RAISING AWARENESS: State Rep. Denny Zent (R-Angola) pairs sneakers with his suit to draw attention to National Cancer Prevention Month Tuesday, Feb. 19, at the Statehouse. 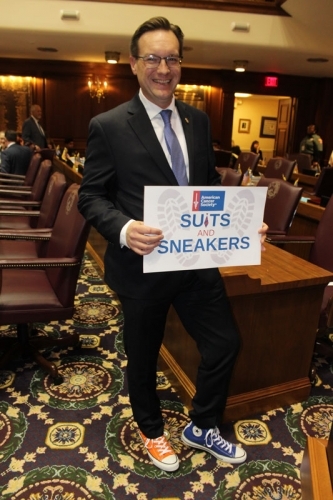 Each year, the Indiana House of Representatives participates in the Suits and Sneakers challenge, an annual event sponsored by the American Cancer Society and the National Association of Basketball Coaches. The event is an effort to highlight ways to reduce the risk of cancer, like eating right, exercising and making healthy lifestyle choices. STATEHOUSE (Feb. 21, 2019) – State Rep. Peggy Mayfield’s (R-Martinsville) legislation prohibiting the practice of dismemberment abortion in the second trimester of pregnancy received a bipartisan vote of 71-25 in the Indiana House of Representatives. According to Mayfield, dismemberment abortions were performed 27 times in Indiana last year. RAISING AWARENESS: State Rep. Tim Wesco (R-Osceola) pairs sneakers with his suit to draw attention to National Cancer Prevention Month Tuesday, Feb. 19, at the Statehouse. 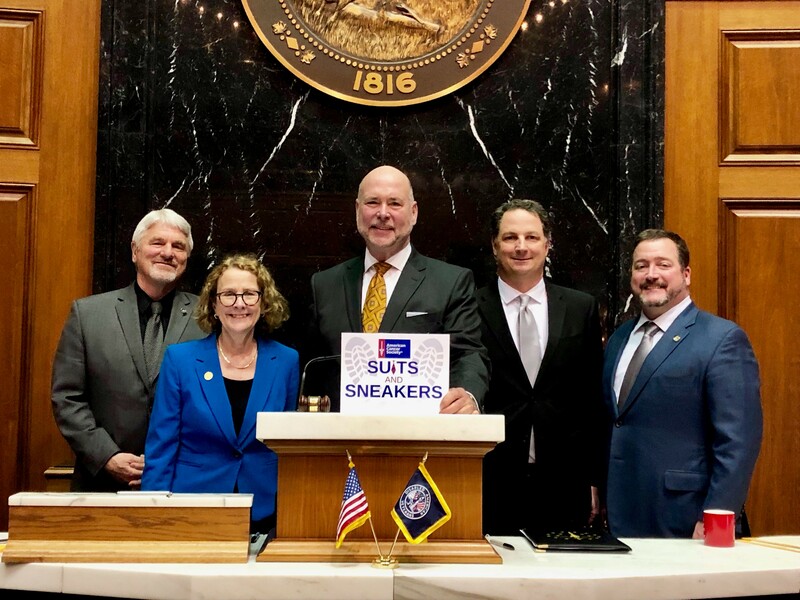 Each year, the Indiana House of Representatives participates in the Suits and Sneakers challenge, an annual event sponsored by the American Cancer Society and the National Association of Basketball Coaches. In the last 25 years, the cancer death rate in the U.S. fell by 27 percent. Over that same period of time, the cancer death rate in Indiana declined by just 19 percent, according to the American Cancer Society. RAISING AWARENESS: State Rep. Doug Miller (R-Elkhart) pairs sneakers with his suit to draw attention to National Cancer Prevention Month Tuesday, Feb. 19, at the Statehouse. 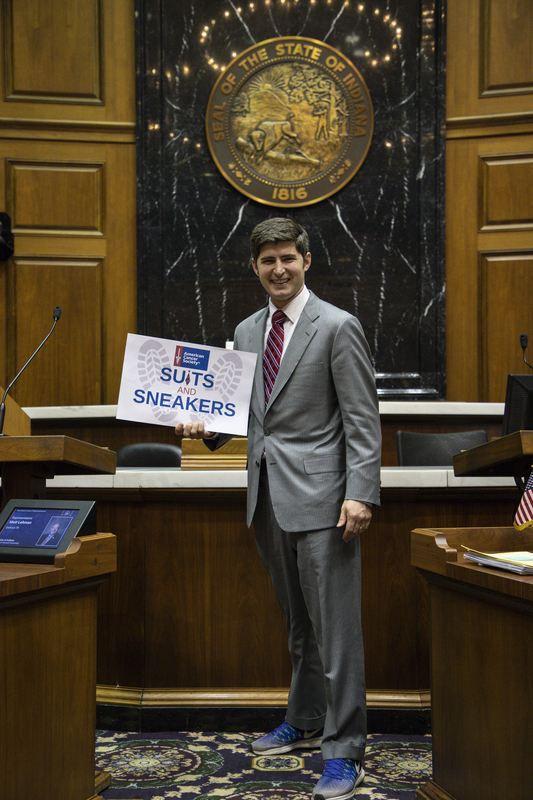 Each year, the Indiana House of Representatives participates in the Suits and Sneakers challenge, an annual event sponsored by the American Cancer Society and the National Association of Basketball Coaches. An estimated 35,280 Hoosiers will be diagnosed with cancer, with an estimated 13,690 expected to die this year from the disease, according to the American Cancer Society. 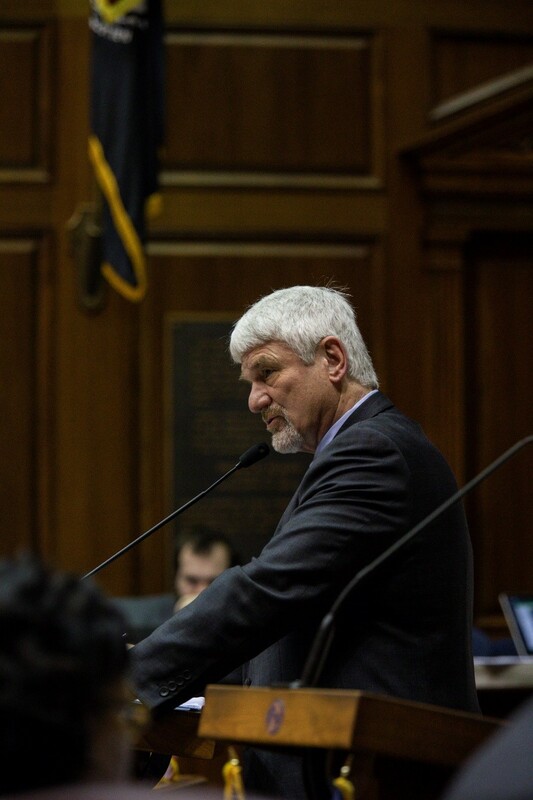 STATEHOUSE (Feb. 20, 2019) – The House of Representatives voted in support of State Rep. Mike Speedy’s (R-Indianapolis) legislation protecting Hoosiers whose intimate photos are shared without their consent. STATEHOUSE (Feb. 20, 2019) – State Rep. Cindy Kirchhofer (R-Beech Grove) recently honored the life of Beech Grove educator Matthew English with a resolution at the Statehouse. 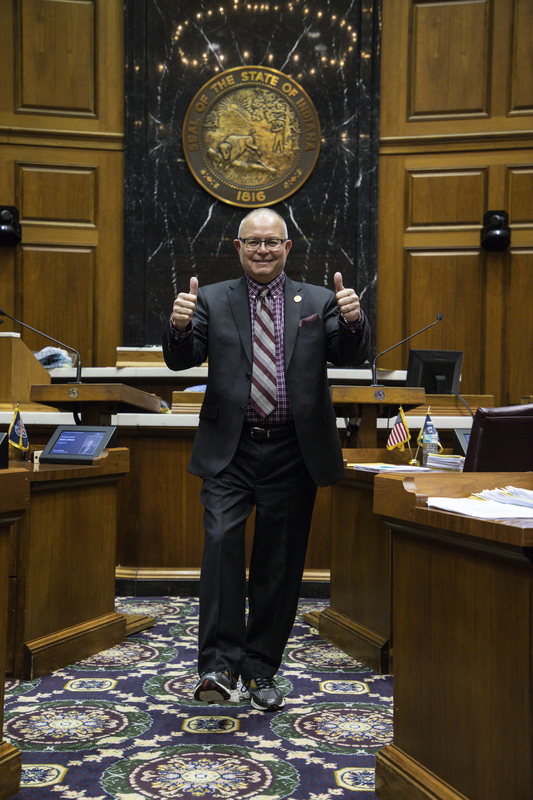 STATEHOUSE (Feb. 20, 2019) — The Indiana House of Representatives voted in support of State Rep. Sean Eberhart’s (R-Shelbyville) legislation that would allow contracts for gestational surrogacy. STATEHOUSE (Feb. 20, 2019) — The House of Representatives Tuesday supported State Rep. Steve Davisson’s (R-Salem) legislation allowing patients to receive emergency prescription refills from pharmacists. STATEHOUSE (Feb. 20, 2019) — The House Veterans Affairs and Public Safety Committee Tuesday voted in support of State Rep. Randy Frye’s (R-Greensburg) legislation calling for more oversight for Indiana’s Military Family Relief Fund.